In July 2014, Emmerson Press, based in Farmer Ward Road, funded the planting of two trees in the children’s play area. 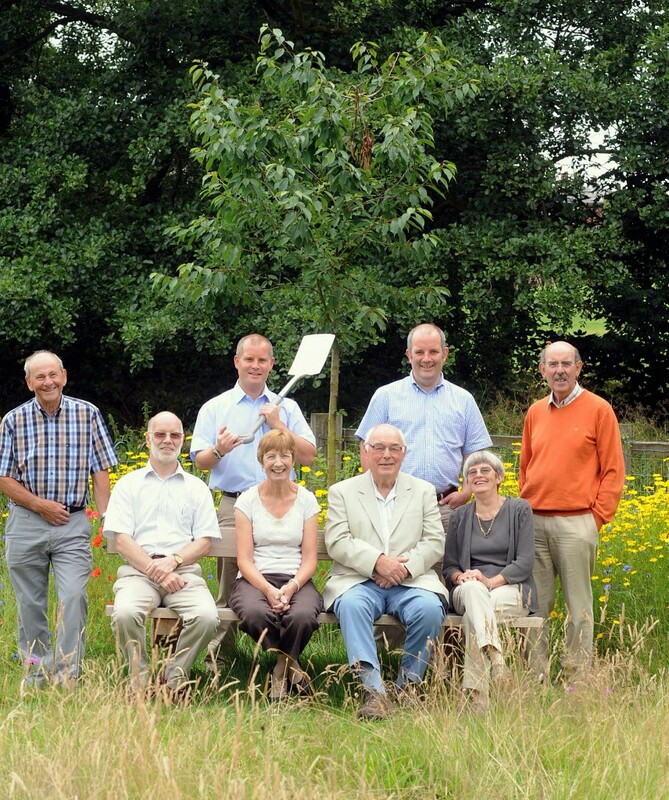 This was attended by John and Jamie Emmerson with members of the Friends of Abbey Fields committee. The photos and media release below were provided courtesy of Emmerson and Advent Communications. Articles on this topic appeared in the Kenilworth Weekly News, the Coventry and Warwickshire Telegraphs and the trade press. 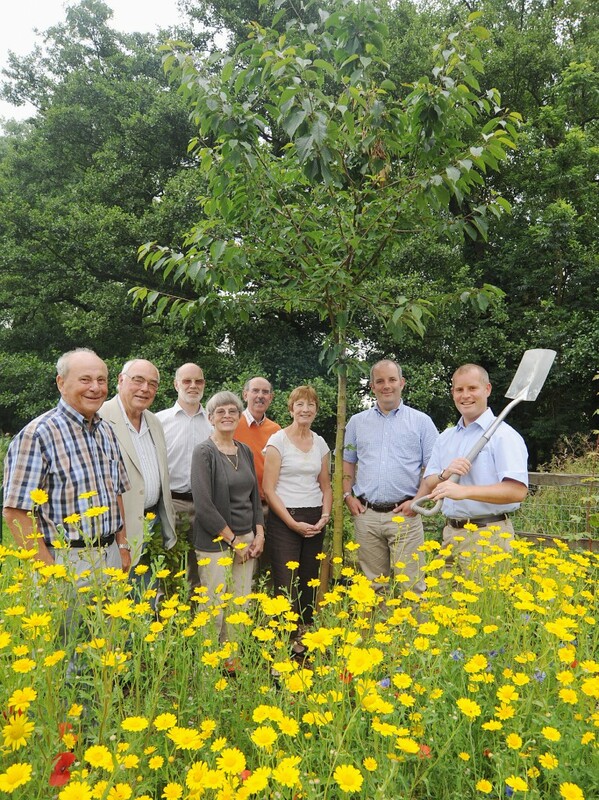 A leading Warwickshire printing firm has planted its roots in support of the environment and donated funds to help a community project blossom. Emmerson Press, based in Farmer Ward Road in Kenilworth, has donated £500 to Friends of Abbey Fields, a group which helps to preserve and enhance the character of Kenilworth’s main park, Abbey Fields. Emmerson Press pledged its support for the project, which included the planting of two trees and a variety of flowers and shrubs, in celebration of receiving environmental accreditation. The company has been awarded ISO accreditation in Environmental Management which recognises the firm’s commitment to maintaining environment friendly practices and compliance with legal and regulatory demands along with continual improvement and the prevention of pollution. John Emmerson, of Emmerson Press, said it was important for the firm to carry out its environmental responsibilities and support projects within the local community. “We live in Kenilworth and visit Abbey Fields regularly with our children. It is a fantastic park and we wanted to do something that would show our support for the committee and enhance the park’s surroundings,” he said. “The children’s play area was completed at the beginning of last summer and we wanted to make a contribution that would help to brighten up the area. “We have supported Friends of Abbey Fields since it was founded in 2002 and we provide a newsletter service which allows the committee to communicate locally. We also planted an oak tree at the fields around five years ago. Gordon Mitchell, treasurer of Friends of Abbey Fields, added: “The project has been a huge success and the place looks superb. You only have to look at the number of people the park attracts to see how important projects like this are within the community. “In 2013/14 Friends of Abbey Fields spent £3400 on Plants. We are extremely grateful to Emmerson Press for donating £500 which has fully funded the planting of two trees and contributed to the variety of brightly coloured wild flowers in the play area. “The company has always been a huge supporter of the work we carry out at the fields and we are delighted to hear that they have secured environmental accreditation. He added: “We are relatively lucky in Kenilworth because a lot of people are happy to support community projects. We have around 200 members with some providing financial support and others volunteer carrying out work at the park.